The Braun BT5050 Beard Trimmer has been designed to couple precision contours with exact length, two of the main fundamentals of any look. Using their extensive experience in the personal grooming field, Braun have produced yet another user-friendly and cutting edge trimmer to give you the close shave and trim you really want. All of the above aside, how well does it actually do the job of trimming your facial hair? Hopefully the Braun BT5050 Beard Trimmer review below will help to shed some light on this for you. 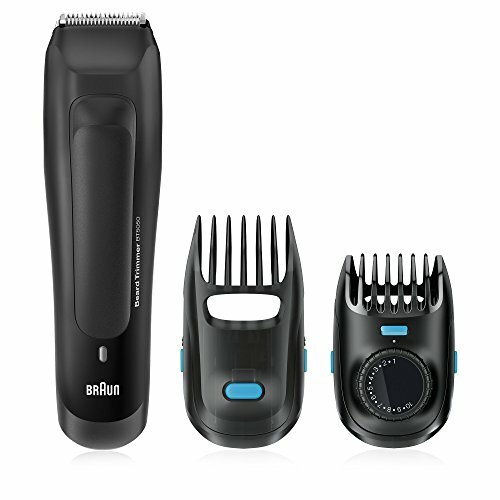 You can use the Braun BT5050 Beard Trimmer to achieve the exact look you desire. Regardless of whether you are looking to trim your full beard or want that designer stubble look, you can use this trimmer for it all. It features 2 completely detachable combs for flexibility. The 1-10 mm precision comb with 0.5 mm steps is what you need to achieve the exact look you want, while the 10-20 mm long beard comb gives you additional versatility to enable you to successfully maintain a longer length beard. You can take this beard trimmer with you virtually anywhere, thanks to the fact it features a powerful, rechargeable Ni-MH batteries that only take around 8 hours to charge to give you a full 50 minutes of trimming without the power cord being necessary. Additionally though, for those times when you are caught without any charge and need to trim or shape your beard, you can simply use the provided AC adaptor to use the trimmer plugged into the mains. There is an LED light on-board that tells you whether it is charging or not, so you always know what is going on with the trimmer. Braun are very aware of the fact that different men have different facial hair styles and that their trimming and shaving needs are all different. The Braun BT5050 beard trimmer has been designed with a certain degree of ergonomics in mind to help ensure it is as comfortable to use whether you are working on that beard for 5 minutes or 25 minutes. It features ultra sharp stainless steel that has been engineered with longevity in mind and will trim long, thick, short and thin hair easily without any tugging or pulling. Another fantastic feature of the Braun BT5050 beard trimmer is that it is almost completely maintenance free. You will never have to worry about having the aforementioned stainless steel blades or combs sharpened or re-oiled. When it does need to be cleaned, you can clean the relevant parts very easily by simply holding the trimmer under the running cold or hot tap. It really is that simple. The sensible thing to do when looking to buy a product online, particularly something that you will probably be using on a regular basis, is to look at customer reviews on sites such as Amazon to see whether people who bought it liked it or not. Looking at the reviews for the Braun BT5050 beard trimmer it is easy to see that the vast majority were extremely happy with the item. Out of 163 customer reviews, the Braun beard trimmer scored an average rating of 4.0 out of 5 stars, with 82 of those customers giving it the full 5 stars. While some people were unhappy with the fact that it comes with a two pin adaptor and you sometimes need to redo particular areas. Although many people feel the trimmer does not catch all the hairs on the contours of your face effectively enough first time and has to be run over areas again, this should only be seen as a minor niggle. 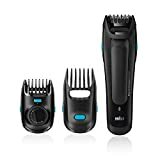 The Braun BT5050 beard trimmer has been designed with your safety and well being in mind and thus repeatedly shaving over areas that are harder to trim first time, will not cause too much irritation at all. That aside and the fact that you have to invest in an adaptor to plug the two pin into so you can use it in British power outlets, the trimmer is a incredibly well made and well priced piece of male grooming equipment.